Fez, spiritual capital of Morocco, is also the birthplace to the most refined and diverse cuisine. 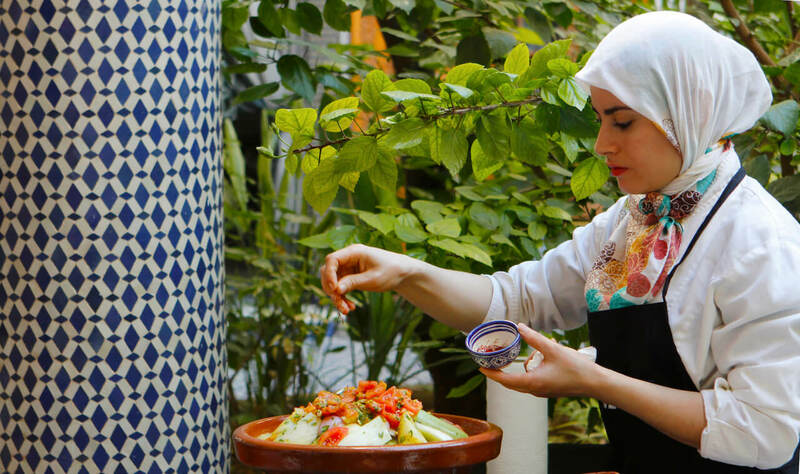 Lift the lid of an earthenware tajine and get under the surface of this fascinating country by plunging into the souks with our chef as a guide and tasting simple delicacies that are on our doorstep. Experience a hands-on cooking workshop at Fez Cooking School at Palais Amani, located in a unique setting with breathtaking views over the medina’s rooftops. Treat yourself to an authentic travel experience! This is a journey with a difference, a cultural exchange that goes well beyond the list of ingredients or a visit to the tourist sites. Palais Amani, home to Fez Cooking School, is an opulent eighteen bedroom luxury Riad, built in an authentic Arabian Andalusian style. Walk through our great cedar doors, and be transported to another world by the sound of the soothing central fountain and the chatter of birds in the garden. 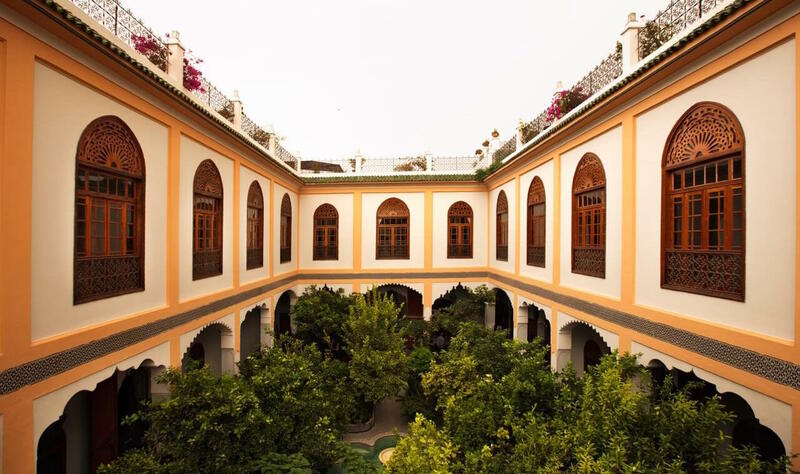 Located within the walls of Fez’s ancient Medina, Palais Amani is a five star luxury boutique hotel, with refined dining and spacious accommodation, an authentic luxury hammam and now home to Fez Cooking School. We at Palais Amani are passionate about our culture our food and our traditions. We loved our time spent with the Amani staff. From our souk visit to the DELICIOUS food we prepared it made for a wonderful experience. Everyone played a role in this great experience from our lovely guide to the chefs, the hotel manager and even the owner. Highly recommend this experience in Fez! I’m still dreaming of the Chicken Tajine we made!! We went for the 4h private class with my boyfriend. The experience was fantastic and the setting incredible. The cooking school is set on the rooftop of the riad and has breathtaking views over the medinas rooftops. We learned to cook a traditional tajine after having shopped for ingredients with the chef in the local souk. Do not hesitate if you’re in Fez, the cooking workshop is an absolute must do! How to understand the way of life in Morocco? Our cooking experience at the Palais Amani was just perfect for that. We got to visit the souk and shop for our cooking class then had the most amazing experience with chef Zakia. A must do if you’re in Fez!. We loved shopping in the Souks with the ladies and cooking the authentic recipes. Highly recommend this Cooking School. My girlfriend and I did one of Palais Amani’s cookery workshops (…) while staying in the riad we had a really great time and can thoroughly recommend it. (…) It was a really great way to spend half a day or so and a rare chance to get an insider’s tour of the market.